I'm predicting a total of three differing Halloween costumes roaming our streets come Friday night - Sarah Palin, Ashley Todd (B-faced or J-faced), and Don Draper, from the hit AMC show Mad Men. If you're going number three, some might think it simple to throw on a grey suit and stick a cigar in your mouth to look the part. But that's not all. It's true, if you want to look like you really just stepped out of a 1960's ad agency on Madison Avenue, it's really all about the hair. 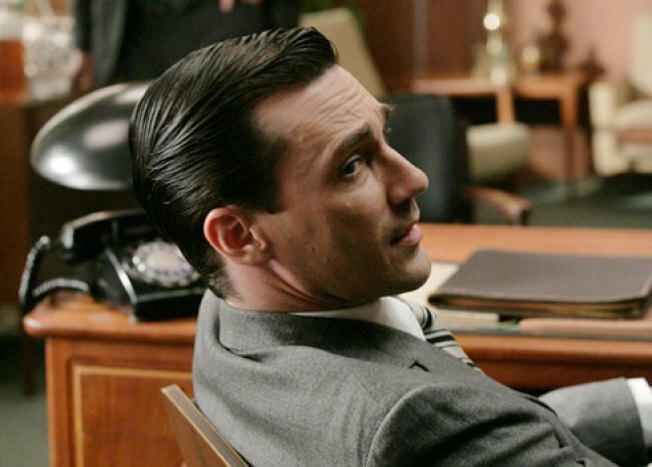 The New York TimesT Magazine takes a look at the goo behind the 'doo, and talks with the the actual "Mad Men" Head of the Hair Department, Gloria Ponce, who shares the secrets behind Don Draper's magnetic dome. The truth is, she doesn't use some mystic blend of egg whites and masculinity sprinkled over a dash of cigar ash and spread through with a comb made from the teeth of your underlings. Oh no, it's just what the Times calls "a stiff cocktail of Redken hair gel and TRI Professional Haircare spray." So, there you have it. Go forth, Dons of New York, and raid your Duane Reed for some Redken for Men to make that costume perfect. Then, if anyone asks how you did it, say something snarky and take a nice, long gulp of whiskey. After all, Don, whether you're fake or real, this city is yours to manipulate.